My husband Tom and I have owned our home in Alabama for 1-1/2 years now. It is 12 acres with a 3/4 acre pond. The first spring we were here we were visited by a pair of Canada Geese, which I promptly named Ricky and Lucy (for absolutely no reason at all). Then they disappeared for over a month, staying in the pond at the other end of the property. When they returned, they had four goslings with them, as adorable as is possible. 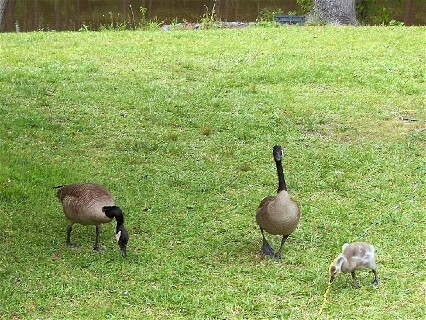 We started feeding them when the goslings were about a month old. Over the course of several months, they "befriended" us and we were able to hand-feed them. They eat constantly off the pond growth and when available, they get into our veggie garden and have a feast! Sadly, over the course of that summer, three goslings disappeared and only Little Ricky was left. When he was about 2 months old, something tried to also take him, but he survived, albeit with a wing that was torn almost completely off. We continued feeding them for the remainder of the summer and then came fall - and Ricky and Lucy left. Over the course of the winter, we changed Little Ricky's feed to cracked corn and continued our efforts to keep him as safe as possible. He grew - and grew - and grew!! And eventually would come whenever we called "Ricky - COME". We started putting his corn on the basement window ledge so it would stay dry, not that it lasted very long. Then my husband lined the bottom of a pallet with styrofoam and anchored it in the pond so he'd have a bigger resting area. He had been using our overflow pipe as a perch --and still does. His wing never grew back and it was very, very sad to see him trying to fly. He runs full out as fast as he can with wings flapping, but to no avail. Happily, Ricky and Lucy returned in mid-February and they are a united family again. Lucy has built a new nest on the other side of our pond and has been laying eggs. So --Tom decided that THIS TIME there would be no thieves in the night. We found some old fencing from the lower pasture, placing the ends of it in the water about 2 ft. from shore, so it is shaped like a huge horseshoe. Then he backed the outside of the fence with barb-wire - and added pine tree logs to insure their safety. This year, we planted some extra greens along the edge of the garden for them but they still find our lettuce, etc. We don't mind at all and just leave them be when they're in there. We are very anxious to see the new goslings and hope that we will eventually be able to also coax them to come when called. Little Ricky loves to bang on the basement window glass, so now we play a game. Our bedroom window is right above that one, so when he started banging on the window, we open the bedroom window!! 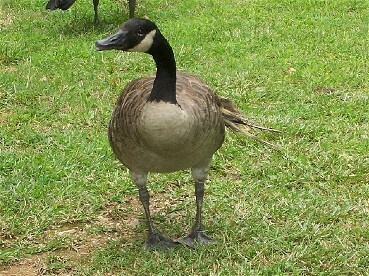 He will stand there, watching us and "talking" to us until he's done playing and then head back to the pond. A new way to entertain Little Ricky when Mom and Dad are gone: My husband puts the kayak in the pond and he and Ricky go up and down the pond side by side. Ricky now goes to the kayak when it's on shore and honks. We're thinking he wants Tom to keep him company. Oh, and now we have a mated pair of Wood Ducks sharing the other end of the pond. I hope you enjoyed our story as much as we love having our feathered friends keeping us company. Our six adorable goslings hatched April 14 and spent the entire day April 15 either on the pond or on the grass right by our bedroom window. Don't have to tell you where we were all day. Lucy and the goslings have been spending the night on the floating pallet my husband put out in the spring. She finally figured out it was probably the safest place they could be. Ricky stays close to her and Little Ricky sleeps on the overflow pipe next to the pallet. It is amazing how fast they're growing and how strong they already are. They scamper all over the property and mom and dad just try to keep up. Now my husband is trying to teach them to stay out of the vegetable garden - hah!! He walks out onto the deck and tells them, "Stay out of the Garden" several times. Most of the time it works (surprisingly) but ever so often he has to walk over there and keep walking toward them until they back out. It has become a three ring circus, especially with our cat keeping watch. He started approaching the goslings the second day they were born. I guess he thought if he could chase Little Ricky, he could go after these guys, too. When Ricky spread his wings and started walking toward him, he high-tailed it for the deck and I don't think his feet even touched the ground until he was on the stairs. He now gives them a very wide berth, no matter where they're at.